Cut generous slices of this vegetarian main dish. You’ll still want more! 1. Cover two 15-in. x 10-in. x 1-in. baking pans with foil and nonstick cooking spray. Place the eggplant and mushrooms on one of the prepared pans. Place the zucchini and red pepper on the second pan. Combine the oil and garlic and brush over both sides of the vegetables. Sprinkle with salt and pepper. Bake, uncovered, at 400 degrees for 15 minutes. Turn the vegetables over. Bake 15 minutes longer. Remove the eggplant and mushrooms. Bake the zucchini and red pepper 5-10 minutes longer or until edges are browned. 2. Cook the lasagna noodles for 1 minute less than package directions. Drain, rinse in cold water, and layer between plastic wrap on a baking sheet. 3. In a bowl, combine the ricotta cheese, Parmesan cheese and egg. Spread about 1/3 cup pasta sauce in a 13-in. x 9-in. x 2-in. baking dish coated with nonstick cooking spray. 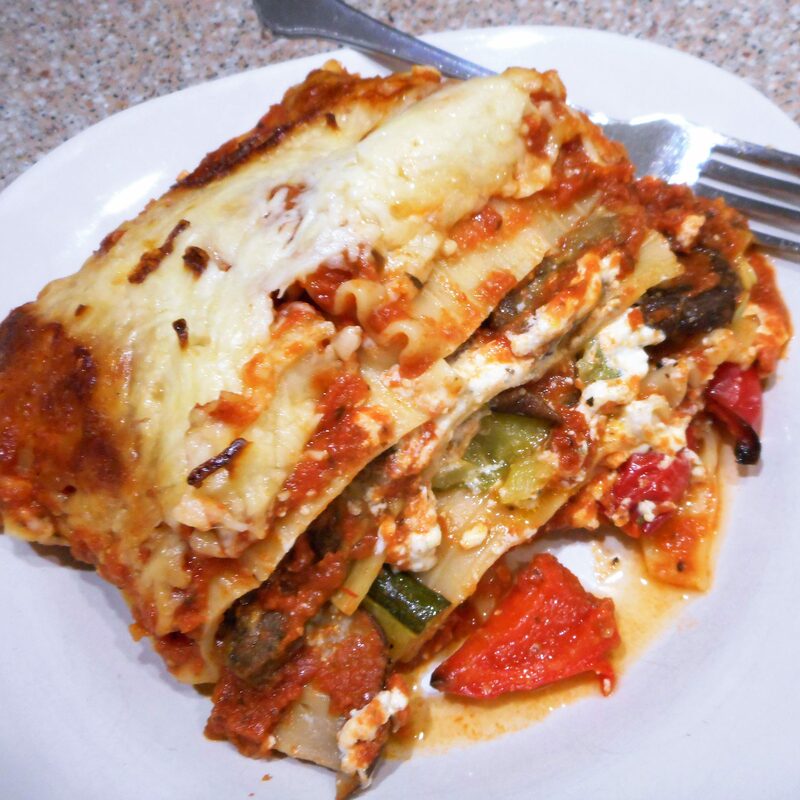 Layer with 3 lasagna noodles. Arrange the roasted eggplant over the noodles, then dollop 1/4 of the ricotta in small spoonfulls over the eggplant. Thinly slice 1/4 of the mozzarella and layer it around the bits of ricotta. Drizzle the cheese with another 2/3 cup of the sauce. Repeat the layers using the red bell peppers along with the mushrooms, and then again make a layer using the zucchini. Top the lasagna off with the last 3 lasagna noodles, cheeses, and sauce, being sure to completely cover the edges of the noodles with sauce so they will not burn. 4. Cover and bake at 350 degrees for 40 minutes. Uncover. Bake 5-10 minutes longer or until edges are bubbly and the cheese is melted. Let stand for 10 minutes before cutting.